In this chapter download, learn about the aspects of designing a data warehouse solution based on SAP NetWeaver BW 7.0 and find out how sales analytics makes up one of the most common requirements for BI solutions across organizations. Chapter 1: The Business Scenario: ABCD Corp.
Business managers look to business intelligence (BI) to help improve the efficiency and transparency of operations. But using BI solutions can also help managers better control the outcomes of certain business decisions, and can aide in the automation of managerial processes. In this chapter from A Practical Guide to SAP NetWeaver BW 7.0, get an overview of how one company utilizes BI solutions for selling processes. In this section, learn why sales analytics are some of the most popular BI projects across organizations. In addition, learn about the aspects of designing a data warehouse solution based on SAP NetWeaver BW 7.0. A clear and comprehensive business requirement leads to a better design of a business intelligence solution. In this chapter, we present a basic sales process scenario for a company, which will be used as a reference in subsequent chapters. The Business Scenario: ABCD Corp.
Business managers always prefer making informed decisions, a process enabled by business intelligence (BI) solutions. A good BI solution improves the efficiency and transparency of operations, offers better control over the outcomes of decisions, and allows you to fully explore all of the options at your disposal. It can also assist in the automation of managerial processes. The process of making decisions for sales growth based on quantitative information is sales analytics, which forms one of the most common requirements for BI solutions across different companies around the world. For this reason, we've chosen to build a simple sales analytics example for a typical company, called ABCD Corp. In the process of building sales analytics for ABCD Corp., we explain all aspects of designing a data warehouse solution based on SAP NetWeaver Business Warehouse (SAP NetWeaver BW) version 7.0. This chapter describes ABCD Corp. and then describes the entities involved in the typical selling processes. Each entity and the process will be referred to throughout the book as we build different components of an analytics solution using SAP NetWeaver BW (version 7.0). ABCD Corp. is a company located in North America with headquarters in New York City. It sells different electronics and white goods (i.e., appliances) to its customers, who are spread all over the world (Figure 1.1). 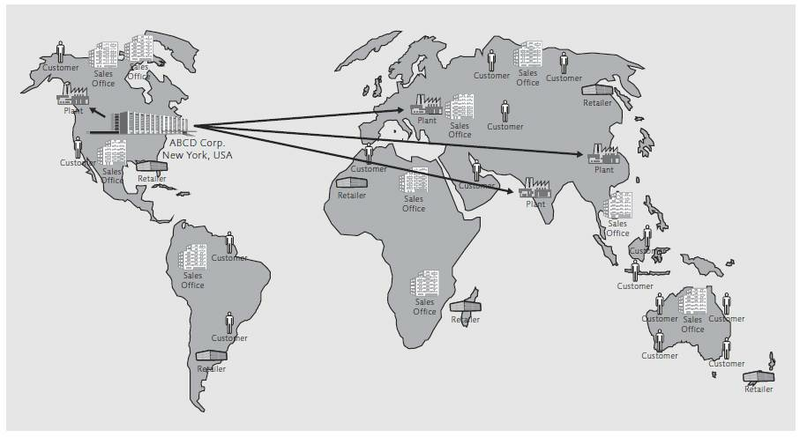 ABCD Corp. has more than 90 worldwide customers, which are either retail chains or independent stores (see Table A.3 in Appendix A, Case Study: ABCD Corp.). The company has three main markets -- North America, Europe, and Asia-Pacific -- and each market has one or more regional marketing offices. Within the US, the customers are grouped by states; outside the US, they are grouped under their respective country or city (e.g., London). 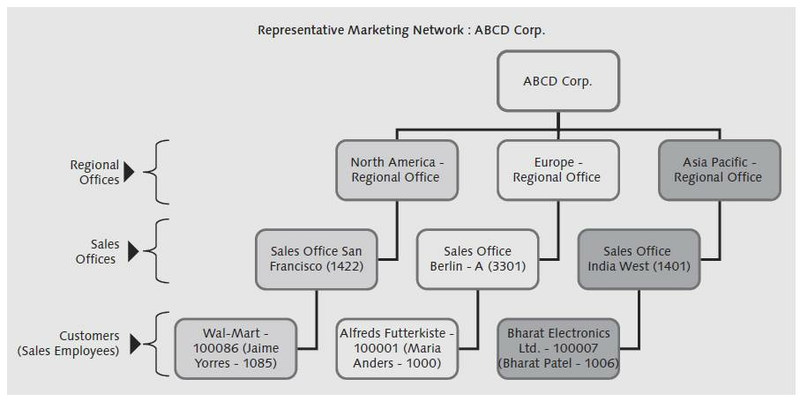 ABCD Corp. has sales offices in most cities where customers are located, and the sales offices report to their corresponding regional marketing office. Figure 1.2 shows a hierarchy of the marketing network. This excerpt from A Practical Guide to SAP NetWeaver Business Warehouse 7.0 by Bharat Patel, Amol Palekar and Shreekant Shiralkar is reprinted here with permission from SAP Press; Copyright 2010. Each sales office has one or more salesperson, and each customer is serviced by a specific salesperson who maintains regular contact with his customers, mainly for the purpose of taking sales orders from them. Whenever an order is placed, a sales transaction is created in the SAP system located at the sales office. The salesperson then contacts his sales office with the details of the order. If the regular sales office is closed, the salesman contacts a sales office in a nearby country to ensure on-time delivery to the customer. Salespeople are rotated from customer to customer after a certain period of time or after the achievement of set target sales. ABCD Corp. has more than 30 products, which are logically grouped into 3 portfolios: Consumer Electronics, Domestic Appliances, and Consumer Lifestyle (see Table A.7 in Appendix A). The company has four manufacturing plants to supply these products (see Table A.2 in Appendix A). ABCD Corp. sells it products through two different selling channels: either directly or through the Internet. 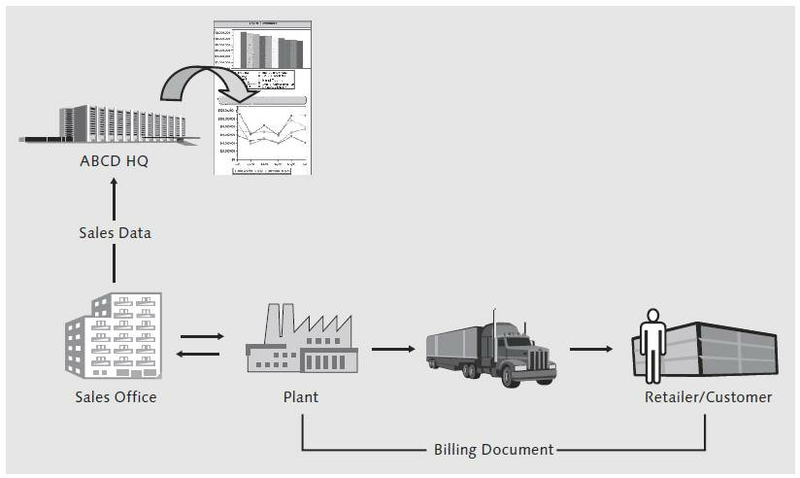 Product sales happen via a billing document; a typical flow of information generated by the creation of a billing document is illustrated in Figure 1.3. Each billing document is represented by a unique number. Within the billing document, one or more products is listed, each of which is identified with an item number. In addition to the item numbers, the billing document also lists the quantity sold and a selling price for each product. In most cases, ABCD Corp. receives payment for products sold when they are delivered to the customer; in some cases, larger customers are permitted to make delayed payments. The terms of payment and type of billing document for transactions differ based on the method by which the transaction has taken place. For example, a specific type of billing document is generated if the customer makes the payment using a credit card or any other mode of delayed payment, and a different type of billing document is generated for immediate payments (see Table A.9 in Appendix A). If the product is sold to a customer outside the US, the corresponding billing document is identified as an export; within the US, it is treated as a domestic sale (see Table A.10 in Appendix A). Whenever the value of a record in the billing document is more than $10,000 USD, the transaction is identified as a high-value transaction, and the billing document is marked with an indicator to differentiate it from those with lower transaction values. Similarly, if the cost of any item in the bill is listed without a value (i.e., is a free item), the system is designed to identify such a record separately (see Table A.11 in Appendix A). Normally, most items require payment; however, for special occasions (the holiday season, clearing sales, etc. ), some low-value products (e.g., cords or batteries) are provided free with a bigger purchase. Such items are listed with an item category of DC, whereas normal items are identified with an item category of NOR. The cost of items under item category DC is recorded on the billing document, but taxes or other costs are not recorded. 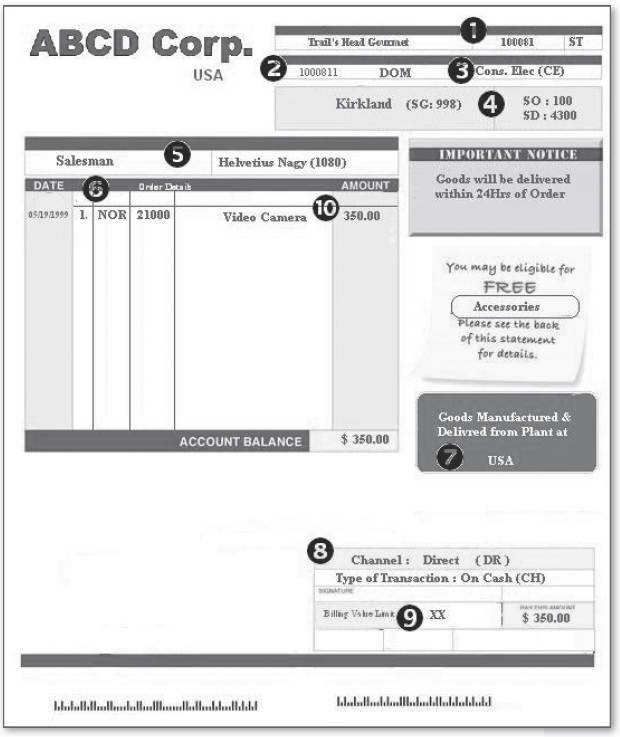 Figure 1.4 shows a sample billing document for ABCD Corp. The sample billing document shows how the business entities and processes are presented. Information such as customer name, customer code, and customer group are captured in (1) of Figure 1.4; the billing document number and type of billing transaction are captured in (2); and the product group is captured in 3. The billing document also provides information about the sales office, sales district, and sales group that services the customer. The name and code of the salesperson responsible for a specific sale is captured in (5). The product, product code, type of item, and product description is captured in (6) of the figure. Information on the plant that manufactured and dispatched the product is captured in 7. The type of transaction and selling channel are reflected on the lower section of the billing document (8), as are the type of billing value and gross billing amount (9). Finally, each item in the billing document has information such as quantity, cost, and net value in USD. For product returns, a credit is issued to the customer. Each item in the return billing document has detailed information about the transaction, such as the quantity, cost, net value, and so on. You can download a pdf of this chapter. You can also visit SAP Press to purchase a copy of Practical Guide to SAP NetWeaver BW 7.0.